>> What is a Bamboo Cutting Board? What is a Bamboo Cutting Board? When you’re working with a knife in your kitchen, you need a cutting board to cut on. Because the knife is going to ruin your kitchen countertop. The knife has no mercy for your countertop. Cutting boards are made of different elements like plastic, hardened glass and bamboo. Among these elements, the bamboo is the most durable and environment-friendly. Because as the bamboo is completely decomposable, it has zero impact on the environment. It also easy to use. The fiber of the bamboo cutting board is going to save the sharp edge of the knife. So the cutting board made of bamboo is called bamboo cutting board. Use of a bamboo is so easy that we don't want to talk about that. The topic we’re are about to talk is that how to clean your cutting board. 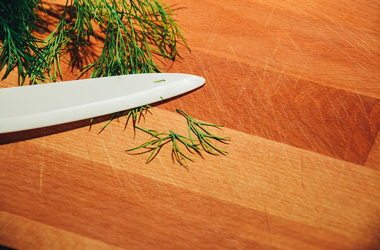 we discuss how you could efficiently clean your cutting board without harming its surface. Let’s get started! How to Clean Bamboo Cutting Boards? Cleaning a bamboo cutting board is a little bit challenging because the bacterias might be trapped in the fiber of the bamboo. So the cleaning process has to be hygienic and 100% effective. We discuss some of the technics you could use to clean your bamboo cutting board. The cutting board maybe hold some residue of the ingredients you previously cut on the board. As the first step of cleaning, you need to get rid of the residue. Use a soft piece of kitchen rug to primarily clean the board. After scraping the board with a soft kitchen rug, you could use ordinary soup to clean deeply. We strongly suggest that you use dishwashing liquid to clean your cutting board. Because dishwashing liquid has some anti-bacterial element that can help you to clean your cutting board. Just rinse the board with kitchen rug and wash it off with tap water. You will get a clean board! you want to sterilize the board for more safety. It is important that you sterilize your kitchen utensil if you are afraid of cross-contamination. You could use 3% hydrogen peroxide or chlorine bleach to sterilize your cutting board. But while you’re using the chemical substance on your kitchen utensils, please be careful! There are a lot of natural anti-bacterial elements around as like salt and lemon. You use your cutting board to cut meat on it then it is important that you clean your board neatly. Because the residue of meat or fish might be trapped in the fiber of the board and create a safe heaven for the bacteria. Take a handful of salt and a lemon. Now spread the salt on the board. cut the lemon into two pieces. Now scrub the board using the lemon as your scrubbing rug. Remember, put the citrus side down. Do the edges and the corners. The salt and lemon create an effective anti-bacterial liquid so that you can get a sterilized board by using the completely natural substance. It is really important that you dry your cutting board so that you use it whenever you need it. It vital for the bamboo cutting board because we all know that water is the #1 enemy of wood or bamboo made utensil. Keep it hanging till it completely dry. After you dry it, you should use some oil on the board which ensures the durability. These technics are on your bamboo cutting board. by applying one of the ideas above, you can easily clean and sterilize your bamboo cutting board.